Now that we've been in our home for a year, I'm finally turning my attention to decorating the basement. I've decided on a travel theme and I want to incorporate some cool vintage map images, a large compass clock, vintage travel cases, various foreign knick knacks, and lots of black and white photos from the places Derek and I have traveled around the world. In keeping with this theme, I decided to try turning one of my Yellowstone pictures into canvas using easycanvasprints.com. This one is of Mammoth Hot Springs. I ordered an 8x10 3/4 inch deep canvas with a black border around the edge to make it pop against the beige wall. I'm thrilled with how it turned out! It's great quality and so cool to see my photo in beautifully wrapped canvas form. I had never seen a custom canvas print before, but I'm so glad I was able to get my hands on this. 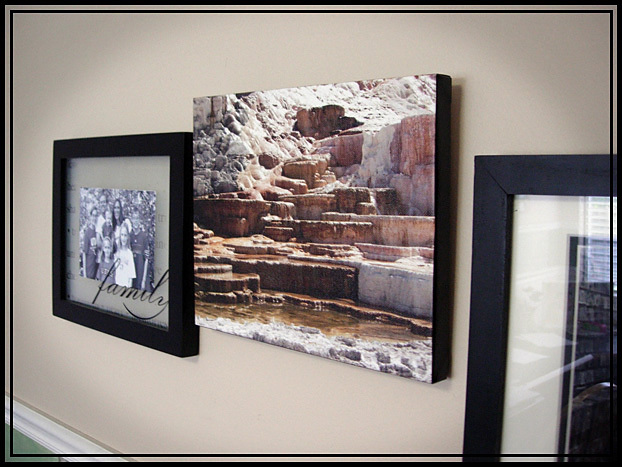 Not only does it make a lovely wall decor piece, but I'm thinking it would make an awesome Christmas present--can you picture a cute canvas photo of all the grandkids on Grandma and Grandpa's living room wall?